Earlier this week we wrote how the price of Ethereum engaged in a mega breakout right after it crossed the triple top price level of $400. That was for us the trigger which confirmed our long-standing price targets: target of 550 USD stil in 2017 and our longer term target of 1000 USD (before 2020). InvestingHaven’s research team noticed something very interesting after this week’s breakout: a trend channel that is developing on Ethereum’s price chart, and it resulted in a series of Ethereum price predictions. Trend channels are the most powerful way to forecast future price direction on a chart. This is not technical analysis, it is chart analysis. Could look similar, but it IS different and sounds different as well. Chart analysis is as relevant as it can be in the cryptocurrencies space. Many think that cryptocurrencies behave differently. We would say that the difference between cryptocurrencies and traditional investments is the rate of change (in other words, how fast they behave), certainly not HOW they behave. Let us focus on what we noticed on Ethereum’s chart. Ethereum was left behind in recent months compared to Bitcoin. Note that Bitcoin has almost tripled since Ethereum peaked in May/June of this year. It is clear that Ethereum and many other altcoins have to catch up with Bitcoin now. Visibly, that is happening right now. Cryptocurrencies typically rise sharply in a very short period of time. We expect Ethereum to pick up steam any time soon, with an acceleration that could bring it significantly higher for a couple of days, only to come back sharply again and test the 400 USD level (its breakout point). The chart below is the one which shows the trend we notice. Given that Ethereum is moving outside of its 150 to 400 USD range, with this weeks breakout, we see that a rising channel is at play, the one indicated with the blue annotated lines. That trend channel gives a short term price target of 600 USD. Uncoincidentally, that is almost the same as the price target we forecasted early this year, i.e. 550 USD. So our previous prediction is now confirmed with this new trend channel. We expect this price prediction to get reached in the coming weeks, before year end. It becomes even more interesting. 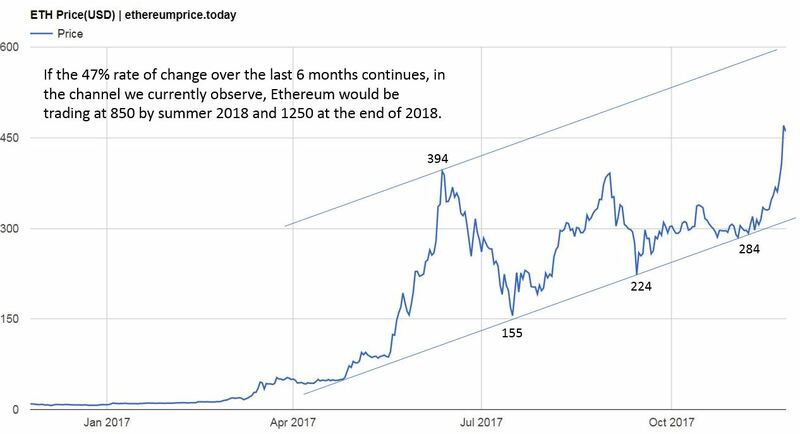 If, and that is a big IF, this new trend channel continues in the coming months and years, we can expect a series of Ethereum price predictions based on the rate of change of 47% over the last 6 months. Within that trend channel Ethereum will trade at 1250 in 12 months from now. That 2020 prediction would be a fourfold increase against our initial prediction of of 1000 USD. Now all this assumes that the current trend channel we noticed is in place AND remains in place. Investors cannot exclude an acceleration nor a deceleration of this channel, so the outcome can be even more bullish or simply will never get there because the uptrend stops (not very likely, but never say never). Are you prepared for this ride?